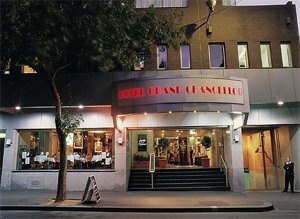 The Grand Chancellor is situated on Lonsdale Street in the heart of the city. This multi award winning hotel is within walking distance to the theatre district, cinemas, Chinatown, restaurants, Melbourne's exceptional shopping and sporting venues. The hotel provides guests with gracious hospitality and friendly, efficient service at realistic prices. SUPERIOR GUEST ROOM WITH 1 KING BED OR 2 SINGLE BEDS..WRITING DESK..LOUNGE FURNITURE AND PRIVATE ENSUITE BATHROOM WITH SHOWER OVER BATH. ROOMS OFFER VIEWS ACROSS NORTH OF CITY. WARDROBE, MINI-BAR AND FRIDGE. TEA/COFFEE MAKING FACILITIES AND CORPORATE AMENITIES. SMOKING OR NON SMOKING FACILITIES AVAILABLE. FProceed to Tullamarine Freeway and follow onto Citylink (tollway), take Flemington Road exit and follow to roundabout. Take Elizabeth Street exit. Proceed to Lonsdale Street and turn left. Follow Lonsdale Street past Russell Street. Hotel situated on the right hand side. * Footlights Restaurant - Open 6:30am-10:30am, casual, buffet breakfast. * Encore Cafe and Bar - Open 9am-midnight, casual, cafe food..snacks..main meals..light meals and brunch. Four meeting rooms are available for use, with an overall capacity of 100 people.